Jim Reed (18? ?-1874) – Little is known of Reed’s early life, but he grew up in Missouri and his family was friends with the Shirleys, who would have the dubious honor of raising the girl who would end up with the nickname of the Bandit Queen – Belle Starr. Reed grew up to ride with Quantrill’s Raiders during the Civil War, along with the James and Younger brothers. When the war was over, he was with the James-Younger Gang when they fled to Texas after they robbed the bank in Liberty, Missouri in 1866. There, he reconnected with Myra Belle Shirley (Starr) and the two soon married on November 1, 1866. Their first child – Pearl was born in 1868. In the meantime, Reed had become involved with the Tom Starr gang, rustling cattle. Reed was soon a wanted man, allegedly for murdering a man named Shannon. Jim and Belle then fled to California with their young daughter and soon had a second child in 1871 named Edward. Soon afterwards, Reed returned to Texas with his family and became involved with the James-Younger Gang as well as continuing to ride with Tom Starr’s gang. In April, 1874, he robbed the Austin-San Antonio stage and though there was no evidence that Belle Reed participated, she was named as an accessory in the indictment. 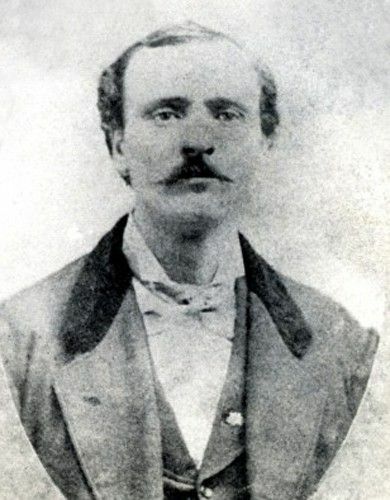 With the law hot on his tail, Jim Reed was killed by a deputy sheriff at Paris, Texas, in August 1874. His widow, Belle then sent her children to Missouri to live with their grandmother and dropped out of sight for a few years until she re-emerged as an outlaw in her own right.